Forum Home - > General > Native Life > Creative Writing > Pow Wow Bermuda Powwow! 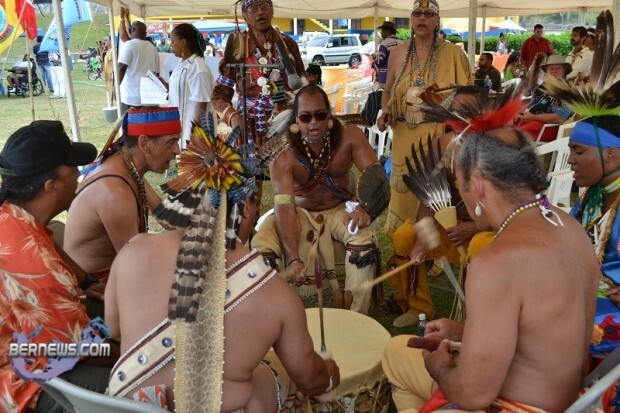 Centuries old traditions blended with elements of the modern world at St. Davids Cricket Club this weekend [June 18/19], as the St. Davids Islanders and Native Community hosted their Annual Bermuda Pow Wow. Ties between Native American tribes and their Bermuda compatriots first began to be celebrated at Reconnection Festivals in 2002. Annual Bermuda Pow Wow,Both days began with the Grand Entry, during which filming was not permitted due to the symbolic nature. The flag bearers entered the Dance Arbour first, and dozens of dancers - compromising visitors, locals and Gombeys followed, all decked out in full regalia. The MCs explained that rather then being considered a costume, the attire should be called regalia. Often pieces of the regalia are family heirlooms, and the feathers in particular are highly valued and cared for. Two people carrying the Bermuda flag and the flag of the St Davids Islanders and Native Community lead the way, and five other people followed behind carrying flags of the visiting tribes, including theEastern Band of the Cherokee Nation and the Blackfeet Nation of Pikuni. They walked slowly in a circle, before the flag bearers stopped in the center facing a small fire. Last edited by AmigoKumeyaay; 09-23-2011 at 07:38 PM..
Wow, that's really cool! I didn't know they had a powwow there. Is this the powwow where they had a grand entry into the Bermuda Triangle and were never seen again? If I ever get rich enuff, I will take all Forums members to the Bermuda Powwow on a cruise ship! that fella who's back is facing the camera...is that a SNAKE SKIN??? What I found interesting about that gombey dance is that I've seen variations of it in places from Bermuda down to the Indians of South America. It is in Central America too. My dad's island has a similar dance. But all the stories about it are different.